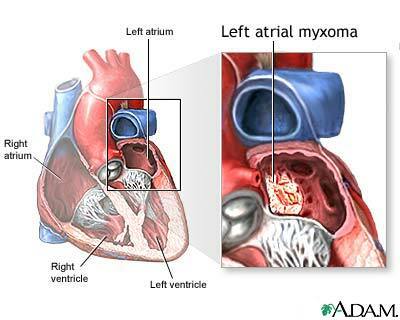 A myxoma is a benign tumor in the heart most commonly found in the left atrium. About 75% of myxomas are in the left atrium, usually beginning in the wall that divides the lower chambers of the heart (ventricles) and growing into the atrium. Treatment is necessary to avoid metastasis and the formation of clots. In addition, untreated growth of the tumor can obstruct blood flow through the heart. Myxomas are curable with surgical removal.